This rare example of an authentic navigator weather charm was found in Bechiyal Village in Yap under the care of Chief Tamag. It is a Janus figure with two faces looking in opposite directions (note one set of arms behind the other). Although Chief Tamag referred to the figure as layow the meaning of this term is obscure. 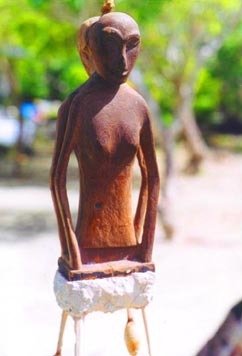 Similarly made effigies in the Central Caroline Islands are called hos because of the sting ray spines which are traditionally attached to the base of the figure.